Virtuous village of AMAR SHAHEED JAIPAL SINGH which is "KHINWASAR", situated thirty (30) kilometers in north from the district headquarters. The Bhoomi of Shekhawati is well known for the brave-hearts, researchers and martyrs born here. Whenever, there was a challenge for the country, martyr of here always lead from the front and sacrificed their lives by keeping the fear aside and kept the nation well-protected from the outside attacks. The brave hearts responded well to each of the attacks came from the enemies. The land of Shekhawati always stood tall with grace, pride and dignity by producing such brave martyrs and added a glorious lesson in the golden history of INDIA. In the same series and maintaining the tradition. AMAR SHAHEED JAIPAL SINGH from village Khinwasar registered his name in golden words in the history of INDIA. JAIPAL SINGH born in 1977 and his parents Shishupal Singh and Banarasi Devi nurtured him. 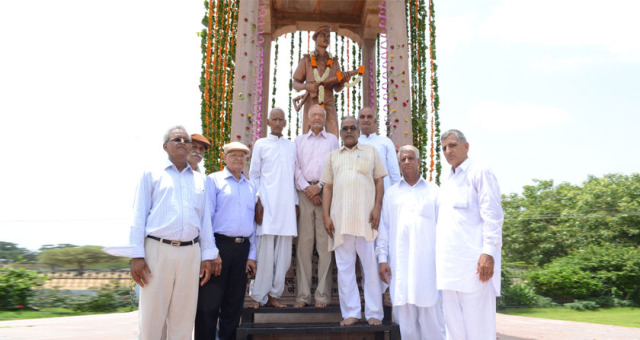 From the childhood itself, JAIPAL SINGH was very gallant and keen to do something for the nation, he passed senior secondary exam from Shri Digamber Jain Senior Secondary School, Sikar and joined the army subsequently. JAIPAL SINGH's father Shishupal Singh always preferred higher education for his intelligent and brilliant son JAIPAL SINGH, however his targets were a bit different. JAIPAL was determined to serve his nation as soon as he could do. So the day came from JAIPAL SINGH headed to his journey with the first step. This was a very interesting turnaround, JAIPAL SINGH was returning to home after taking admission into the college and on the way he saw the queue of JAWANS(Soldiers) near to Police Lines, Sikar (his hometown) and instantly he joined the team by adding himself in the queue and finally got selected in Indian Army. After completion of 1 year training, JAIPAL SINGH transferred to "JAT REGIMENT" and in a very short time the entire unit shifted to J&K (Jammu and Kashmir) and he was placed at border. During the tenure, JAIPAL SINGH promoted to the post of "NAYAK". SINGH was posted at Rocket launcher Detachment No 1 of a Search and Destroy party in Gurage sector of J&K, at that time terrorists started sudden firing in which few scouts and soldiers of LMG detachment of No. 1 were badly injured. However, JAIPAL SINGH still headed to the terrorists with the great courage. Suddenly, one burst of bullets attacked to him but in spite of that he fired a rocket launcher and killed 2 terrorists with that. NAYAK JAIPAL SINGH was badly injured with the bullets but still he kept himself well-placed at the field to save his colleagues. Meantime, he kept out safe his team members by helping them. In this effort, JAIPAL SINGH bleeded a lot and sacrificed his life for the nation. In the above mission, total 8 terrorists were killed and a lot of explosive seized by the army. For this great effort and sacrifice, brave mission and the heroism he have shown and the victory achieved over the terror by saving the lives of the mates in spite of intensive firing and in adverse conditions, NAYAK JAIPAL SINGH was awarded with SENA MEDAL (BRAVERY) by Government of India for this supreme sacrifice. In respect of his great job, Village committee sent the proposal to state government, for changing the name of village "Chalka Ki Dhaani" to "Shaheed J. P. Nagar". The state government accepted this suggestion and currently this spiritual village is known as Shaheed J. P. Nagar in blessed remembrance of this AMAR SHAHEED. If we open up the history of village Khinwasar, the young generation of here always had an inclination towards joining the army and serving the nation. Before independence, 4 soldiers form here were in the army and shown a great bravery in Second World War. Till date, in total 32 soldiers from this village retired from the army. In 1962, Hassam Khan from here became shaheed and In Sri Lanka, Mr. Phool Chnad Meel braced the death for his nation. Still, the Soil of this village is producing great martyrs and commandos and we all hope and pray for the same. TO RESPECT A SHAHEED IS RESPECT FOR THE ENTIRE BRAVE TRADITION. TO RESPECT A SHAHEED IS A PRIDE FOR THE NATION. In the today's scenario, example of JAIPAL SINGH's bravery will definitely inspire and motivate the coming generations and this tradition will goes on and on. This monument created in the remembrance of SHAHEED JAIPAL SINGH is folding an inspirational history and we are confident that the coming future will be full of these.